I have a Frozen DVD (by Disney) and I'd like to convert it by HandBrake without losing quality so I want to know which one is better, h.264 or mpeg-4, after ripping by HandBrake? Without any doubt, HandBrake supports Xvid (MPEG-4) and AVC/H.264 (Handbrake uses free x.264). Both MPEG-4 and H.264 are nice video formats (different from MP4, a container format). MPEG-4 is a widely used (audio and video) compression method standardized by MPEG group, and H.264 is a new video codec standard that realizes high quality video in relatively low bitrates. But what are the differences between the HandBrake conversion of MPEG-4 and H.264 if you want to get an .mp4 video file? How to Rip DVD to MP4/H.264 with DVD Ripper? Best Handbrake alternative for Windows (10)/macOS: Help convert (protected) DVDs to MP4 (MPEG-4/H.264) or any other format for easier playback. One of the merits of H.264 is the high compression rate. It is about 1.5-2x more efficient than MPEG-4 encoding. According to some tests, H.264 is about 5-10% better quality. It's safe to say H.264 has more fluent and better video quality for real time playback. But most users say their disparity of image effect is too slight to notice. It does encode way slower on all Macs (this was not tested on an Intel Mac). H.264 encoding takes about 75-100% more time when all else is equal so the trade off is your call. H.264 takes about twice the time to encode a higher quality video at the same file size. If in a same image quality, H.264 video will take less space. However, the file size of H.264 video is larger compared with MPEG-4 video that is converted from the same DVD or file, and it consumes more power and space on cell phones, such as iPhone, correspondingly. H.264 has lower bit-rate requirement for network transmission. In other words, AVC has better network transmission. Although both MPEG-4 and H.264 video formats are accepted by many common Browsers (e.g. : Firefox supports H.264 on Windows 7 and later), video players and portable devices (e.g. : Apple integrated H.264 support into Mac OS X v10.4 "Tiger" and QuickTime 7), MPEG-4 obviously is more widely used and supported. Anyway, MPEG-4 and H.264 are just two encoding methods for a MP4 video. We can feel free to play back our MP4 videos on iPhone (X), iPad (from 1st Gen to iPad Air 2 Retina), Android smartphones (incl. Samsung Galaxy S8, Note 8), Android tablets (incl. Amazon Kindle Fire HDX, Google New Nexus 7), website (YouTube, Facebook, Vimeo), game consoles (Sony PS4, Microsoft Xbox One), WP9, Surface Pro 4, Chromecast and so on. Step 1. Download, install and open HandBrake. Insert the source file under the button "Source" on the top left. Step 2. Select the output container format between MP4 or MKV. HandBrake only has the two formats to choose. Step 3. In the middle part that arrays several options, click "Video", and you can choose either H.264 (x264), H.264 (Intel QSV) or MPEG-4 as the Video Codec. If you choose H.264, we suggest you check 2-pass Encoding. Step 4. Make many other fussy settings and click Start on the top. Although HandBrake can convert Blu-ray or DVD to MP4 using H.264 (x264), MPEG-4 (FFmpeg) or MPEG-2 (FFmpeg), it does not support copy-protected/encrypted DVDs, for the lack of decrypting ability. Plus, it has no specific profiles for the majority of devices, making it difficult and inconvenient to complete the DVD conversion directly, especially for lay persons. Even so, HandBrake has being complained for many errors. To get rid of this, people tend to use the best HandBrake alternative – WinX DVD Ripper Platinum. Step 1. Download, install and launch the DVD to MP4 ripper. Add the DVD source in the form of DVD disc, ISO image or VIDEO_TS folder. The main DVD movie title will be auto selected without the need of playing it first on 5KPlayer or VLC. Step 2. Find Apple Device in the output profile category, and click "to iPhone Video". For ripping DVD to MP4 video format for iPhone X or iPhone 8 Plus, the codec of MPEG4 + AAC is recommended, with the resolution of 640 x 480. 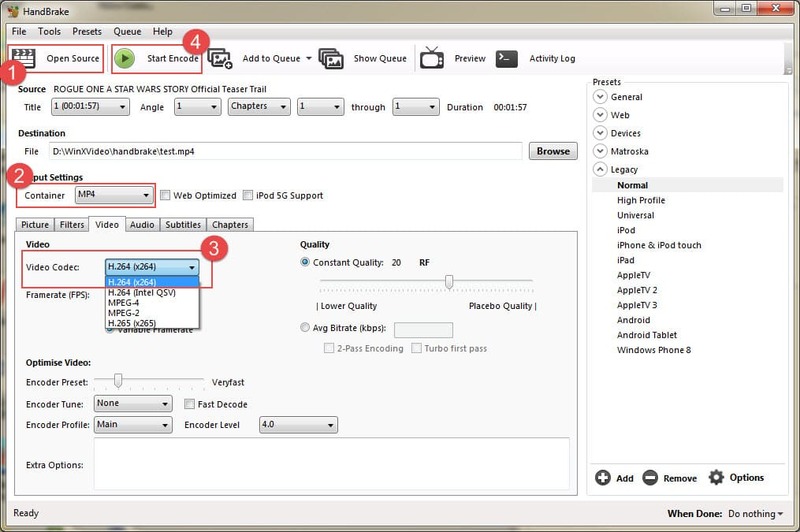 For an even higher video quality, you can choose H.264 codec instead. And then, click OK. Step 3. Browse throughout your computer to set the destination folder for your converted movie file. Step 4. 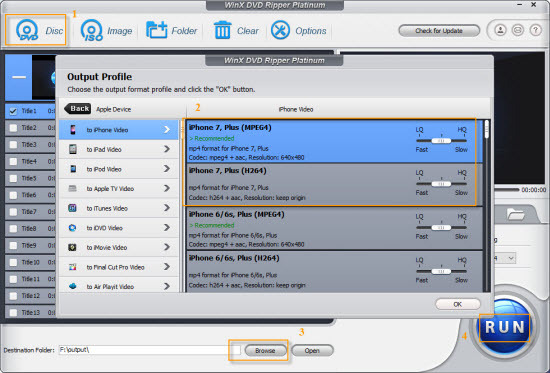 Hit RUN and start a fast and steady Frozen DVD to iPhone MP4 conversion journey. Digiarty Software does not advocate ripping copy-protected DVDs for any commercial use and suggests referring to the DVD copyright laws in your countries before doing so. To make up what free HandBrake is incapable of, the alternative will not only convert DVD to MP4, H.264, Apple TV, iPhone, iPad, iPod Touch or Android, but also rip DVD to AVI, MOV, WMV, MPEG, MTS, FLV, M4V, YouTube, Mac, WP8, Surface Pro, Amazon Fire phone, PSP, Fujitsu and so on, and 1:1 copy DVD to ISO image, MPEG2 or DVD folder.